All leather scabbards are made in our shop. 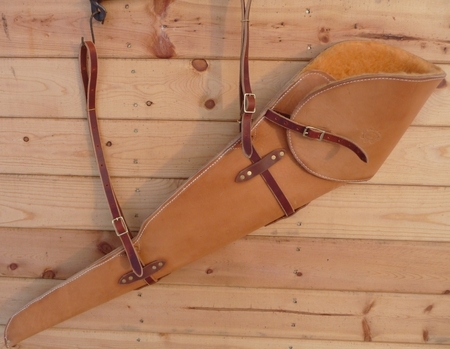 The picture shows a lined leather scabbard. We gladly take custom orders. Simply send us a pattern with measurements and a description of your desired design & color. We use a 10-12 oz. oiled skirting leather. The scabbards are heavy duty & made to last for many years. We build the rifle scabbard in our leather shop. Custom orders are welcome.